Words Are Powerful – So Is Your Voice! These are the opening lyrics to a song I wrote with my students. We were inspired by comments made in the classroom. I had been troubled by the impact of certain comments. Teasing and light-hearted banter may be frequent in social settings – and in any context, let alone a classroom, they can get out of hand, misunderstood, and spiral into something more destructive. No matter your context – whether like me you work in international music education, requiring cultural intelligence, effective teaching and learning, and musical consonance – words are the tools we use – every day. As a parent and professional educator I hope you’ll agree – words are incredibly powerful. What’s more, your voice – both your literal, audible voice, as well as your more literary, figurative voice – carry great weight, importance, and potential to spread joy and truth, or sow seeds of distrust and distress. Indeed, each day, whether we speak a few hundred words or several thousand, there are words that are life-giving and others that are life-depleting. Do you sow words of truth, joy, and life? Do you spread compassion, care, and kindness? 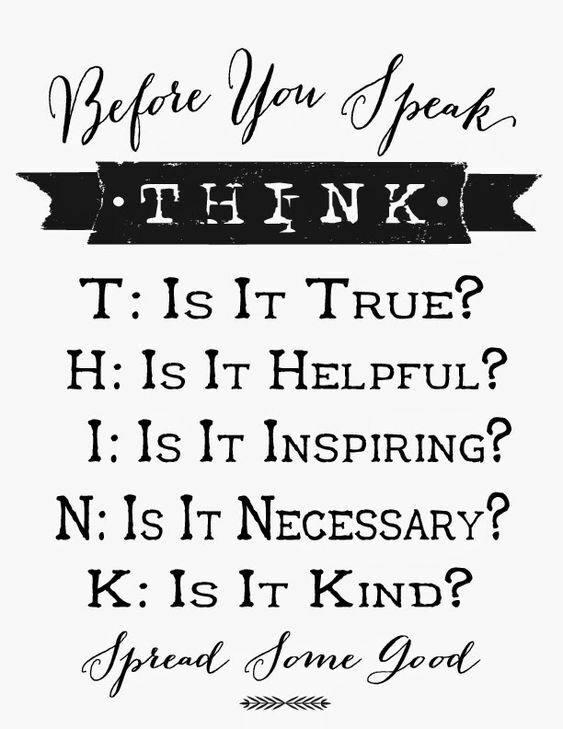 To answer these questions, let’s take a look at an acronym: THINK before you speak. Is it True? Is it Helpful? Is it Inspiring or Important? Is it Necessary? And finally, is it Kind? Of course, as adults, we see the nuance in situations and the need for discretion, discernment, speaking truth, and at times, confrontation. Yet, how carefully do we weigh our words – especially those we speak out loud? Once spoken, words cannot be returned to the sender, replaced or exchanged, and certainly not refunded. While there is scope for apologies, retractions, and the like – words spoken are like nails hammered into a fence. Once in place, you can attempt to remove them. However, the scars and marks will remain. There are three types of words, or talk, that are important. There are the words we hear others speak in our presence, the words we say to ourselves – our self-talk – and the words we talk about with others and about others. The second and third types are affected by the first, but let’s focus today on what we can talk about. Here are some simple examples. Do you find yourself saying these? I have all the time I need to do the things I choose to do. I have something or someone to attend to right now, but let’s schedule a time to work on that later. What are your limiting beliefs? Do you find yourself saying these out loud – to yourself, or others? What could you replace these with? Talk it out on Twitter or the comments below!